I had heard the music of Ivan Black with his album tribute to Edgar Froese, Remember the Dream Goes On. A very nice album, a very favorite in reality, which is available in downloadable format via the English site specialized in EM, Musiczeit. And according to what I was able to notice, the works of the English synthesist seem to be divided into two possibilities of download; that of Musiczeit for a more rhythmical, a more sequenced EM and his Bandcamp page for his more experimental, his more ambient music. “All's Well That Ends Well” is available on the English site. For Ivan Black, his last opus is a collection of music pieces which exploits various rhythmic approaches. And he is damn right! “All's Well That Ends Well” is a rather surprising album of which the biggest achievement is to bring the listener through the multiple rhythmic mazes which criss-cross their charms in the lands of Electronica, kind of FAX Label, or of Berlin School with good constant movements of sequences. If the rhythms are legion, the atmospheres which surround them are not outdone. 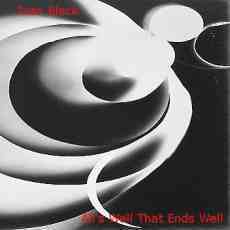 Ivan Black shows a lot of creativity by decorating the 83 minutes of his album of electronic effects as much cosmic than Italian avant-gardist style, here I think in particular of "Movement In Light", and of solos very in the tones which greet structures of rhythms always rather diversified, otherwise rich in development. And it begins with "Helsinki Knights". The intro is weaved of nebulosity with long twisted woosh which release their cosmic gas in the resounding effects of chords whose the forms of a totally uncertain hip-hop throw a veil of mysticism to this at least theatrical opening. Pulsations and tsitt-tsitt invite each other to this fragile shape of rhythm. Sequences, skipping from an ear to another, eventually structure a form of gallop. And from gallop, the rhythm adopts finally the ride of the knights of Helsinki with a steady rhythm which gradually will increase the pace as the minutes are fading to the meter. Sequences, percussions and these resonant chords from the intro unite their rhythmic fates around a structure animated by these ill-assorted elements which run and jump up under a sonic sky filled of electronic effects and of more musical, even melodious, solos which are totally convoluted. Just to oil well his rhythmic views, Ivan Black paints his introductions with more or less ambient phases which are of use as pattern to a thick cloud of tonal possibilities. As in "Glass Tears" where chords in the shape of glass are clicking in ambiences filled of threatening waves and with echoing hoops. That is going to take a good three minutes before a superb structure of sequences makes a horde of keys raging and which shove in a too narrow tube to allow them to perform oversized capers. The rhythm is thus lively and steady, such as small feet running after their shadows, with these sequences which are drumming on a felted skin and which avoid constantly the bites of cymbals and the glass glints which ring since the opening. It's a good track which is mainly arched on the nuances of the rhythm, while "Indestructible Object" offers a more lively rhythm. A heavier and an almost more rock rhythm which gives more latitude to the effects, to these long twisted bombs, to these sibylline singings and to these spectral lamentations of the synths. That my friends, is a track which unscrews the ears! "Cadeau" also, but for another reason. It's a real gift of tenderness for the soul. A beautiful ballad sat on a swarming bed of sequences, on well felt percussions and on jerky pulsations among which the multiple beating, the chaotic jolts and the variables trampling excite a delicious swarm of more harmonious sequences which floats all over the track and invite the nuances in tones and harmonies to compete with these uncountable synth solos which tear up, and the soul and the ears. The structure is interrupted in two places by a kind of guitar effect which every time restructures the ballad and continues to feed the nuances of this fascinating meditative ballad which hooks onto our ears on the first listening. Pure candy for the ears! "Rayograph" also proposes this approach of ride which makes the charms of "Helsinki Knights", but with a more nervous, a bumpier movement knotted with good kicks, both in the jolts of the sequences and the percussions. The synth solos decorate this rhythmic staging of purely electronic flavors which remind me the IC years, in particular with Clara Mondshine's Memorymetropolis. The sequencing too by the way. At this point, this album continues to be very enticing. We are within the limits of a great EM album. "Movement In Light" re orientates a bit the celestial bodies towards a structure of a kind of ambient/chill with a line of bass which puts its clothes of cosmic funk. The chords resound among many pulsations which sound like a hundred of lost steps and of percussions at the metallic jingles. The music remains very lunar with beautiful synth pads which crumble their interstellar fragrances in what becomes little by little a good morphic down-tempo. It's a good moment of relaxation in this boiling universe of sequences and percussions that is “All's Well That Ends Well” where solos, clearly more elegiac here, flow on a structure which reminds me at times the boldnesses of Baffo Banfi. Idem with "Endgame" which, after a very ambiospherical intro fed by beams of light swirling such as sirens, opens again these structures of rhythms where the sequences, the pulsations and the percussions weave hybrid elements which answer to this inexhaustible need that have the bulimics of sequenced EM to saturate their ears with starts of rhythms and rhythms which destabilize the enchantment. The main skeleton breaks up its joints which foment the cores of nervous and belligerent rhythms, while synths try to resound a glass revolt which little by little reason the main dissidence of its axis, after a short ambiosonique phase. The title-track ends with a hopping rhythm. A jumping rhythm still braided around a meshing of sequences, pulsations and percussions to which Ivan Black adds riffs and chords of keyboards which are very near the effects of the rhythm elements. The jingles of percussions dance airily over this structure which skips as much as limps under a dense sonic wall of resounding strands which make all the charms of “All's Well That Ends Well”. So much in the title-track as in the whole album which is a really nice game of rhythms, all kinds taken together and which will incite me for sure to discover a little more the Ivan Black universe!